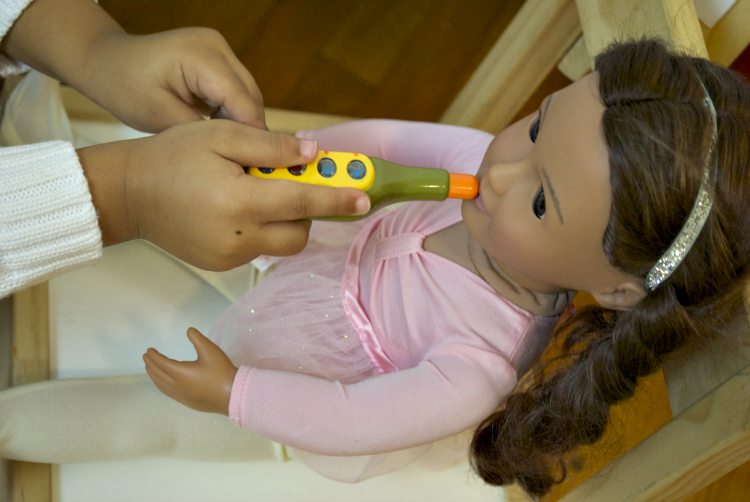 We received a complimentary Wee MD from B. toys for the purpose of this review. All opinions are my own. 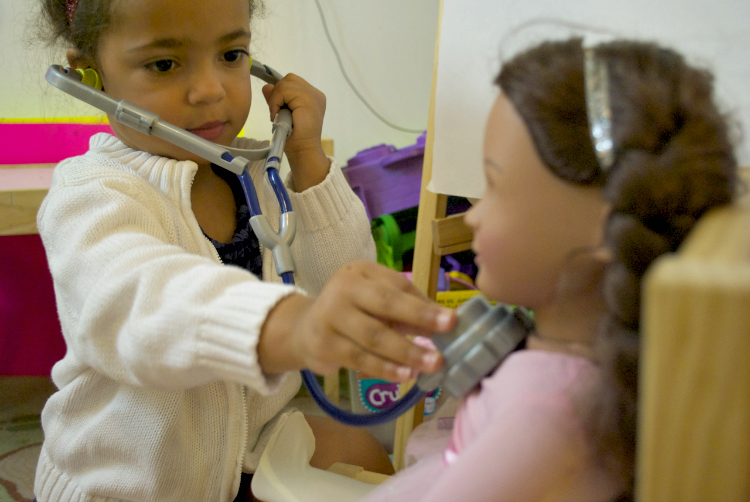 From the very moment Zion could grasp the idea of "being" something when she grows up, she has remained firm in her desire to be a Doctor. We've been waiting for any kind of shifting, but she is still sure that it is what she wants to be. I guess Jerry and I should start saving for medical school immediately, right!? 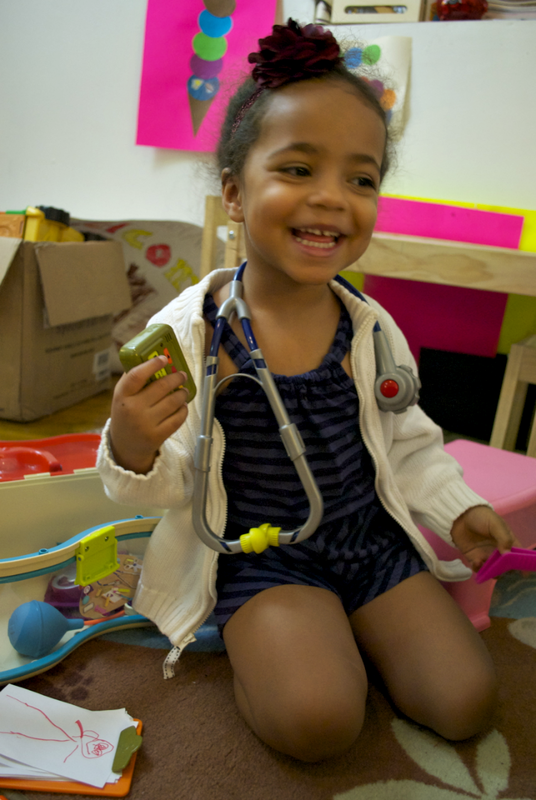 In the meantime, we have discovered a really cool new doctor play kit that allows Zion to "play doctor" to her heart's content, the B. toys Wee MD. The Wee MD is a collection of 14 fun and interactive tools to play doctor with, including a house call case to store them in. 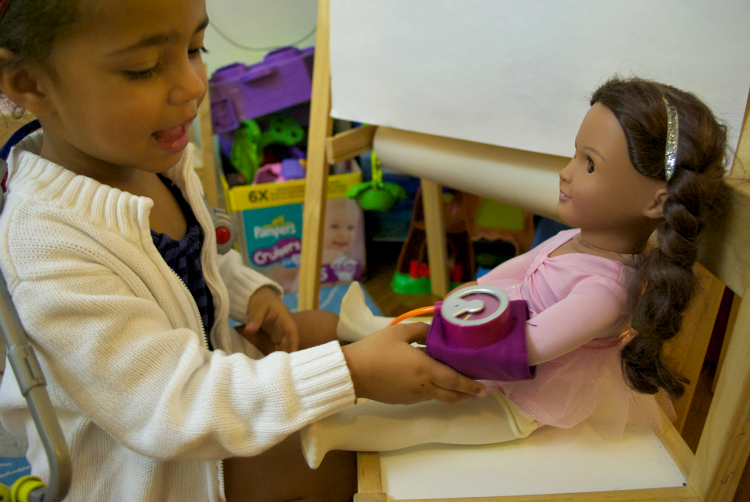 We love that the stethoscope makes real heartbeat sounds when you push the red button on the back of it while listening in the ear pieces. Another favorite is the pager, which has three different buttons to push - each with a different hospital paging sound. There is also a thermometer that has a sliding lever on the side that changes the color to red to indicate hotter temperatures. Other tools included in the kit are a blood pressure cuff with gauge and spinning needle, tweezers, scissors, notepad and paper, reflex hammer, ear checker, doctor's name badge and bandage. 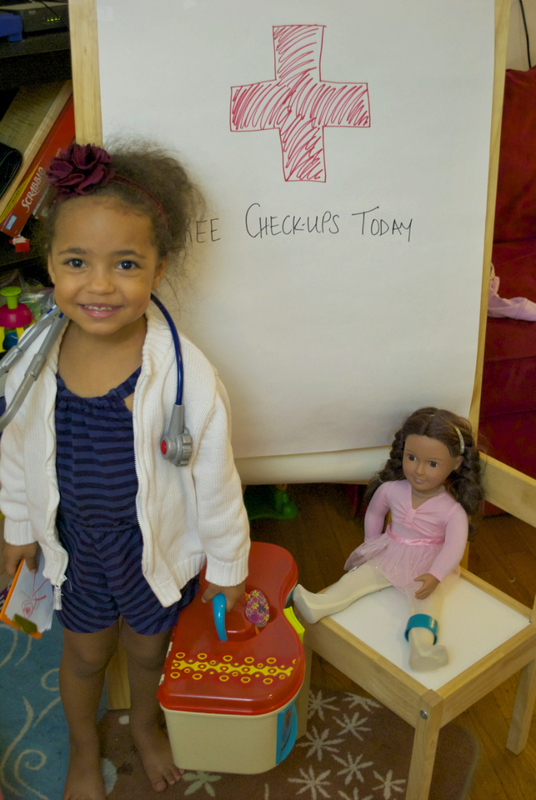 While Zion's usual favorite patient is her daddy, she also loves lining up her dolls and stuffed animals for her clinical rounds. To be honest, I love watching her play doctor. 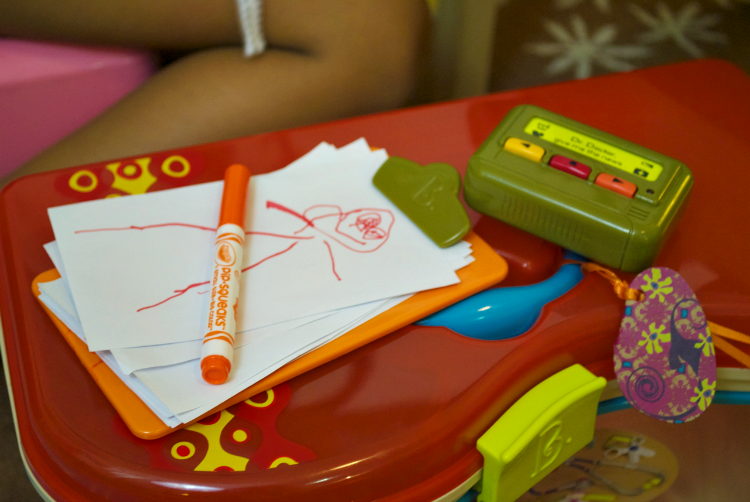 She really loves playing into this role, often repeating the actions of her pediatrician or the things she has seen at my wellness visits - with hilarious accuracy. Luckily in real life we don't end every doctor's appointment with the dreaded "shot." 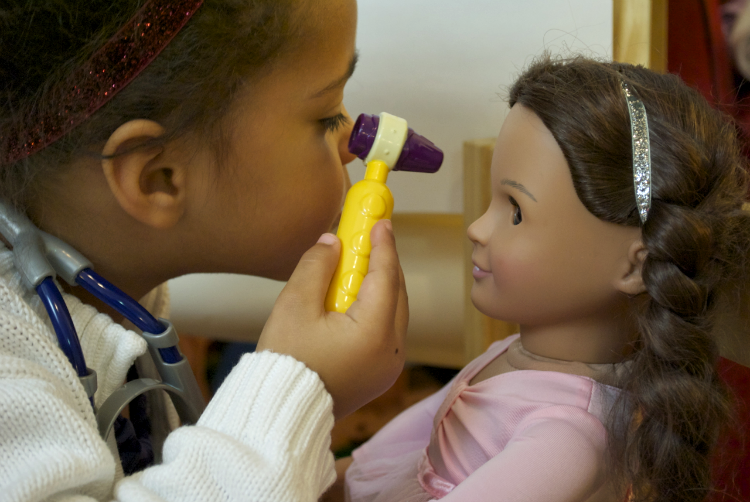 Dr. Zion offers up the tip to "think of something happy" just before she sticks you with her pretend syringe. She also likes to call for back-up using her pager. "Hi, I have a 'mergency and I need help with a patient," she states into her pager. (She has no example of how to use one of these so it's treated like a cell phone by default.) 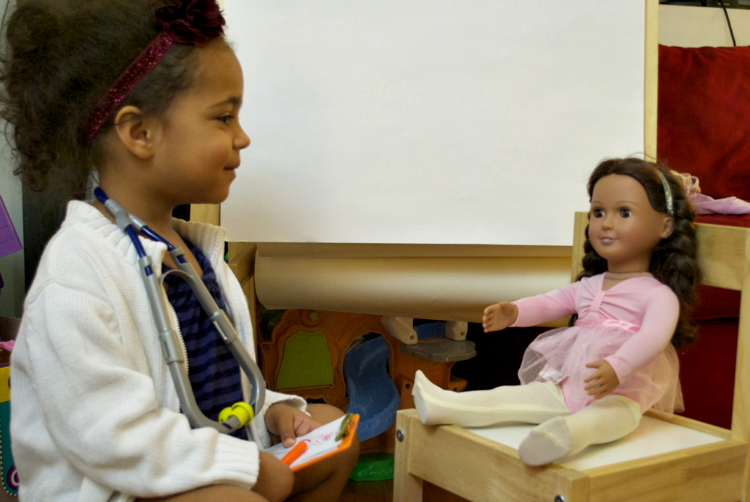 Then after nodding her head as if agreeing with the doctor on the other end, she addresses her dolly and lets her know that the doctor will be there in 5 minutes. 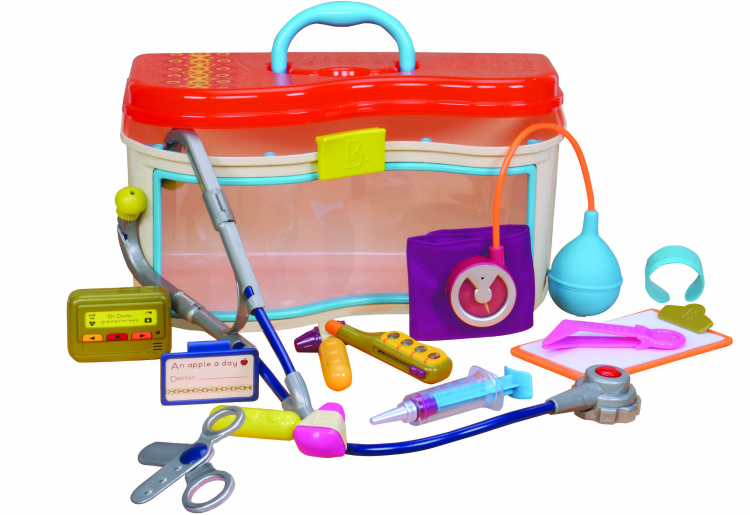 We love the Wee MD from B. toys, it is the best play doctor's kit we've ever found. You can get yours at Target (in-stores & online), for $22.99. She's so cute!!! Start saving now....I have one in nursing school which is no where near what it costs to be a doctor. Precious memories!! Oh my!! This will be perfect when we watch White Christmas on Thanksgiving evening. My girls are going to LOVE this!! Thanks for the awesome recipe!! No problem! 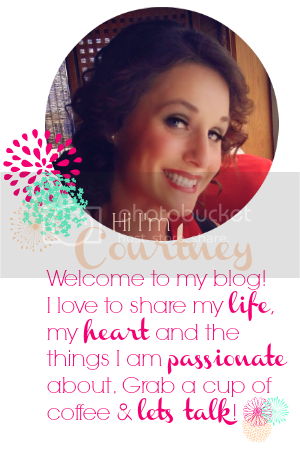 Let me know if you like it!! This is too adorable! My daughter is OBSESSED with Doc McStuffins (which we totally love btw) I'll have to keep my eyes peeled for a set like this. This would make an awesome Christmas present for her! This is hands down our favorite kit we've come across!